Synthetic peptide within Human HMGB1 aa 150 to the C-terminus (internal sequence) conjugated to keyhole limpet haemocyanin. The exact sequence is proprietary. Our Abpromise guarantee covers the use of ab18256 in the following tested applications. WB Use a concentration of 1 µg/ml. Detects a band of approximately 29 kDa (predicted molecular weight: 25 kDa). Multifunctional redox sensitive protein with various roles in different cellular compartments. In the nucleus is one of the major chromatin-associated non-histone proteins and acts as a DNA chaperone involved in replication, transcription, chromatin remodeling, V(D)J recombination, DNA repair and genome stability. Proposed to be an universal biosensor for nucleic acids. Promotes host inflammatory response to sterile and infectious signals and is involved in the coordination and integration of innate and adaptive immune responses. In the cytoplasm functions as sensor and/or chaperone for immunogenic nucleic acids implicating the activation of TLR9-mediated immune responses, and mediates autophagy. Acts as danger associated molecular pattern (DAMP) molecule that amplifies immune responses during tissue injury. Released to the extracellular environment can bind DNA, nucleosomes, IL-1 beta, CXCL12, AGER isoform 2/sRAGE, lipopolysaccharide (LPS) and lipoteichoic acid (LTA), and activates cells through engagement of multiple surface receptors. In the extracellular compartment fully reduced HMGB1 (released by necrosis) acts as a chemokine, disulfide HMGB1 (actively secreted) as a cytokine, and sulfonyl HMGB1 (released from apoptotic cells) promotes immunological tolerance (PubMed:23519706, PubMed:23446148, PubMed:23994764, PubMed:25048472). Has proangiogdenic activity (By similarity). May be involved in platelet activation (By similarity). Binds to phosphatidylserine and phosphatidylethanolamide (By similarity). Bound to RAGE mediates signaling for neuronal outgrowth (By similarity). May play a role in accumulation of expanded polyglutamine (polyQ) proteins such as huntingtin (HTT) or TBP (PubMed:23303669, PubMed:25549101). Nuclear functions are attributed to fully reduced HGMB1. Associates with chromatin and binds DNA with a preference to non-canonical DNA structures such as single-stranded DNA, DNA-containing cruciforms or bent structures, supercoiled DNA and ZDNA. Can bent DNA and enhance DNA flexibility by looping thus providing a mechanism to promote activities on various gene promoters by enhancing transcription factor binding and/or bringing distant regulatory sequences into close proximity (PubMed:20123072). May have an enhancing role in nucleotide excision repair (NER) (By similarity). However, effects in NER using in vitro systems have been reported conflictingly (PubMed:19446504, PubMed:19360789). May be involved in mismatch repair (MMR) and base excision repair (BER) pathways (PubMed:15014079, PubMed:16143102, PubMed:17803946). May be involved in double strand break repair such as non-homologous end joining (NHEJ) (By similarity). Involved in V(D)J recombination by acting as a cofactor of the RAG complex: acts by stimulating cleavage and RAG protein binding at the 23 bp spacer of conserved recombination signal sequences (RSS) (By similarity). In vitro can displace histone H1 from highly bent DNA (By similarity). Can restructure the canonical nucleosome leading to relaxation of structural constraints for transcription factor-binding (By similarity). Enhances binding of sterol regulatory element-binding proteins (SREBPs) such as SREBF1 to their cognate DNA sequences and increases their transcriptional activities (By similarity). Facilitates binding of TP53 to DNA (PubMed:23063560). Proposed to be involved in mitochondrial quality control and autophagy in a transcription-dependent fashion implicating HSPB1; however, this function has been questioned (By similarity). Can modulate the activity of the telomerase complex and may be involved in telomere maintenance. In the cytoplasm proposed to dissociate the BECN1:BCL2 complex via competitive interaction with BECN1 leading to autophagy activation (PubMed:20819940). Involved in oxidative stress-mediated autophagy (PubMed:21395369). Can protect BECN1 and ATG5 from calpain-mediated cleavage and thus proposed to control their proautophagic and proapoptotic functions and to regulate the extent and severity of inflammation-associated cellular injury (By similarity). In myeloid cells has a protective role against endotoxemia and bacterial infection by promoting autophagy (By similarity). Involved in endosomal translocation and activation of TLR9 in response to CpG-DNA in macrophages. HMG box 2 mediates proinflammatory cytokine-stimulating activity and binding to TLR4 (PubMed:12765338, PubMed:20547845). However, not involved in mediating immunogenic activity in the context of apoptosis-induced immune tolerance (PubMed:24474694). The acidic C-terminal domain forms a flexible structure which can reversibly interact intramolecularily with the HMG boxes and modulate binding to DNA and other proteins (PubMed:23063560). Phosphorylated at serine residues. Phosphorylation in both NLS regions is required for cytoplasmic translocation followed by secretion (PubMed:17114460). Acetylated on multiple sites upon stimulation with LPS (PubMed:22801494). Acetylation on lysine residues in the nuclear localization signals (NLS 1 and NLS 2) leads to cytoplasmic localization and subsequent secretion (By similarity). Acetylation on Lys-3 results in preferential binding to DNA ends and impairs DNA bending activity. Reduction/oxidation of cysteine residues Cys-23, Cys-45 and Cys-106 and a possible intramolecular disulfide bond involving Cys-23 and Cys-45 give rise to different redox forms with specific functional activities in various cellular compartments: 1- fully reduced HMGB1 (HMGB1C23hC45hC106h), 2- disulfide HMGB1 (HMGB1C23-C45C106h) and 3- sulfonyl HMGB1 (HMGB1C23soC45soC106so). Poly-ADP-ribosylated by PARP1 when secreted following stimulation with LPS. In vitro cleavage by CASP1 is liberating a HMG box 1-containing peptide which may mediate immunogenic activity; the peptide antagonizes apoptosis-induced immune tolerance (PubMed:24474694). Can be proteolytically cleaved by a thrombin:thrombomodulin complex; reduces binding to heparin and proinflammatory activities. Nucleus. Chromosome. Cytoplasm. Secreted. Cell membrane. Endosome. Endoplasmic reticulum-Golgi intermediate compartment. In basal state predominantly nuclear. 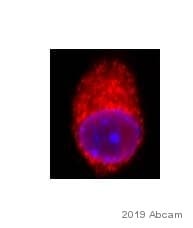 Shuttles between the cytoplasm and the nucleus (PubMed:12231511, PubMed:17114460). Translocates from the nucleus to the cytoplasm upon autophagy stimulation (PubMed:20819940). Release from macrophages in the extracellular milieu requires the activation of NLRC4 or NLRP3 inflammasomes (By similarity). Passively released to the extracellular milieu from necrotic cells by diffusion, involving the fully reduced HGMB1 which subsequently gets oxidized (PubMed:19811284). Also released from apoptic cells (PubMed:16855214, PubMed:18631454). Active secretion from a variety of immune and non-immune cells such as macrophages, monocytes, neutrophils, dendritic cells and natural killer cells in response to various stimuli such as LPS and cytokines involves a nonconventional secretory process via secretory lysosomes (PubMed:12231511, PubMed:14532127, PubMed:15944249). Secreted by plasma cells in response to LPS (By similarity). Found on the surface of activated platelets (PubMed:11154118). Lanes 1 - 4: Merged signal (red and green). Green - ab18256 observed at 29 kDa. Red - loading control, ab9484, observed at 37 kDa. ab18256 was shown to recognize HMGB1 in wild-type HAP1 cells as signal was lost at the expected MW in HMGB1 knockout cells. 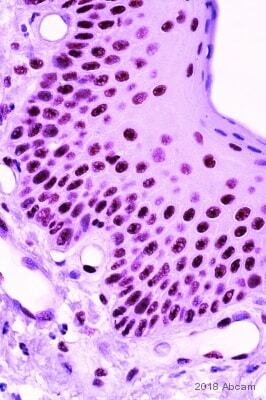 Additional cross-reactive bands were observed in the wild-type and knockout cells. Wild-type and HMGB1 knockout samples were subjected to SDS-PAGE. Ab18256 and ab9484 (Mouse anti-GAPDH loading control) were incubated overnight at 4°C at 1 μg/ml and 1/20000 dilution respectively. Blots were developed with Goat anti-Rabbit IgG H&L (IRDye® 800CW) preabsorbed ab216773 and Goat anti-Mouse IgG H&L (IRDye® 680RD) preabsorbed ab216776 secondary antibodies at 1/20000 dilution for 1 hour at room temperature before imaging. 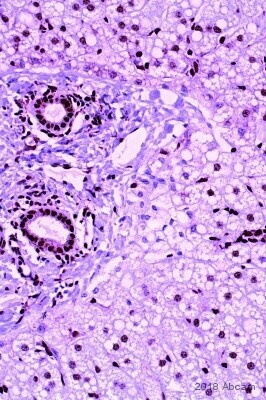 HMGB1 nuclear expression (brown staining) was seen in all pancreatic compartments, including stromal immune infiltrate: top panels show PanIN-1 (left) and -2 (right) (magnification ×50, insert and second panel x100); bottom panels show PanIN-3 (left) and PDAC (right) (magnification ×100 and ×50, respectively). PDCA = pancreatic adenocarcinoma. PanIN = precursor lesions. ab18256 is used at 1/1000 dilution. ELISA - Anti-HMGB1 antibody - ChIP Grade (ab18256)Image courtesy of an anonymous Abreview. ab18256 used in Direct ELISA in NIH 3T3 murine fibroblasts. Primary antibody used at a 1/1000 dilution for 16 hours at 4°C. The secondary antibody is an AP-conjugated Goat anti-rabbit used at a 1/1000 dilution. A blocking step was performed using 5% BSA for 1 hour. 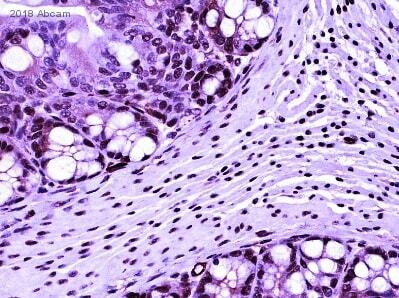 ab18256 staining HMGB1 in Human stomach tissue sections by IHC-Fr (Immunohistochemistry - Frozen sections). Tissue samples were fixed with acetone and blocked with 5% serum for 1 hour at 25°C. 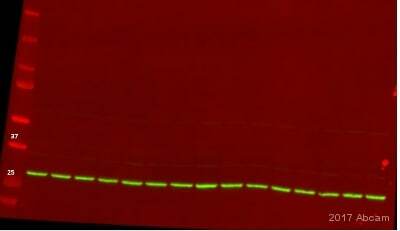 Samples were incubated with primary antibody 1/500 in blocking buffer for 1 hour at 25°C. An undiluted HRP-conjugated Goat polyclonal to rabbit IgG was used as secondary antibody. Observed band size: 29 kDa why is the actual band size different from the predicted? Paraffin embedded sections of human liver were incubated with ab18256 (1/1000 dilution) for 30 minutes at room temperature. Heat induced antigen retrieval was performed in citrate buffer pH 6. Immunohistochemistry (Formalin/PFA-fixed paraffin-embedded sections) - Anti-HMGB1 antibody - ChIP Grade (ab18256)This image is courtesy of an anonymous Abreview. 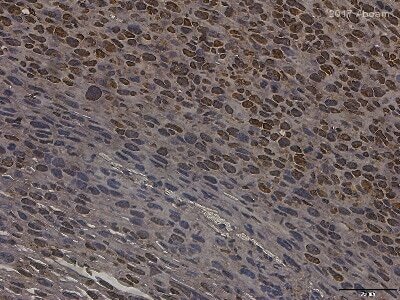 ab18256 staining HMGB1 in mouse liver tissue sections by Immunohistochemistry (IHC-P - paraformaldehyde-fixed, paraffin-embedded sections). Tissue was fixed with formaldehyde and blocked with 15% serum for 60 minutes at 20°C; antigen retrieval was by heat mediation. Samples were incubated with primary antibody (1/1000 in TBS) for 18 hours at 20°C. An Alexa Fluor® 647-conjugated goat anti-rabbit IgG polyclonal (1/500) was used as the secondary antibody. Lane 7 : Rat brain whole tissue lysate - infused with LPS for 4 weeks, after 2 weeks of LPS infusion were treated with memantine for the next 2 weeks. 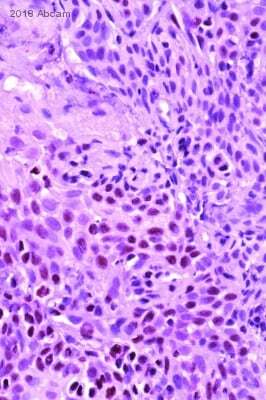 Immunohistochemistry (Formalin/PFA-fixed paraffin-embedded sections) - Anti-HMGB1 antibody - ChIP Grade (ab18256)Image courtesy of an anonymous Abreview. ab18256 staining HMGB1 in murine kidney tissue by Immunohistochemistry (Formalin/PFA-fixed paraffin-embedded sections). Tissue was fixed in formaldehyde and a heat mediated antigen retrieval step was performed using citrate EDTA buffer pH 6.2. Samples were then blocked, then incubated with ab18256 at a 1/1000 dilution for 1 hour. The secondary used was a goat anti-rabbit IgG conjugated to HRP at a 1/1000 dilution. Publishing research using ab18256? Please let us know so that we can cite the reference in this datasheet. Today I have made western blot as you recommended with 0,1- 10 µg protein pr. well, I used the antibody in a 1:2000 dilution. And It worked very well. I exposed the film for 1 min. and got only one band and a very strong signal. Thanks for your help. That is good news! I am glad I could be of help. If you have any other difficulties with our antibodies or other products, please contact us.